Not a church or a castle, but a former silk trade market. 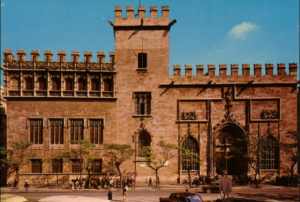 Lonja de la Seda or Lonja of Merchants (in Valencian Llotja de la Seda or Llotja de Mercaders) is a masterpiece of civilian Valencian Gothic architecture in the late Middle Ages. Not a church or a castle, but a former silk trade market, Lonja de la Seda is the place where merchants met for negotiations and closed deals. 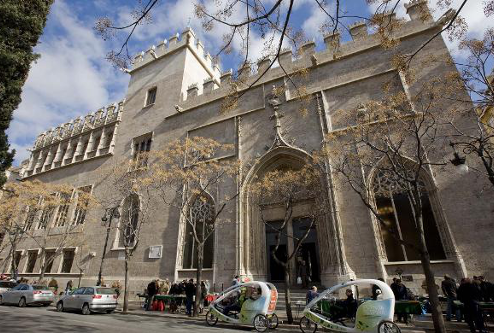 It is considered the result of the prosperous economic position of Valencia during the 15th Century. Local industries, especially textiles, developed greatly during that time and the city became an important commercial center, where merchants from all over Europe came. La Lonja was a veritable trade temple of the Middle Age. 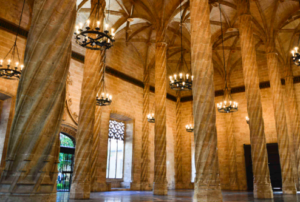 La Lonja was the symbol of strength and wealth of the city in the Golden Age. In 1996 it was declared a UNESCO World Heritage Site.